Jim Beaver has Red Bull athlete and Trophy truck racer Andy McMillin on the show talking about this past weekend's San Felipe 250 he won and his career in off-road. Be sure and subscribe to Project Action and the Down & Dirty Radio Show on iTunes and follow @JimBeaver15 on social media. Jim Beaver has NASCAR driver and one of the stars of CMT's new show Racing Wives, Amber Balcaen, on project Action this week talking about her career, trying to make it to NASCAR's top level, and filming reality TV. Be sure and follow @JimBeaver15 on social media and subscribe to project Action and the Down & Dirty Radio Show on iTunes. Jim Beaver finally gets around to answering all of your fan questions on today's Project Action as he prepares to race in this weekend's UTV World Championship. Be sure and follow @JimBeaver15 on social media and subscribe to Project Action and the Down & Dirty Radio Show on iTunes. Today's Project Action on PodcastOne throws it all the way back to the show's beginning! Relive Jim Beaver's epic interview with Ken Block, the Head Hoonigan in Charge himself, as he opens up about one of the most illustrious and iconic careers in modern motorsport. Be sure and Subscribe on iTunes and follow @JimBeaver15 on social media. Jim Beaver has Subaru rally legend David Higgins on the show this week talking about his illustrious career and what's next for him as well as BetOnline.Ag's Dave Mason talking about March Madness and the upcoming MMA fights. Be sure and subscribe on iTunes and follow @JimBeaver15 on social media. Jim Beaver has his latest motorsports power rankings along with Chris Leone as well as interviews with Sara Price, Craig Scanlon, and Seth Quintero out at the Mint 400. Be sure and follow @JimBeaver15 on social media and subscribe to Project Action and the Down & Dirty Radio Show on iTunes. Athlete, Racer, Podcaster, & Entrepreneur Jim Riley Returns! Jim Beaver has his good friend and entrepreneur Jim Riley back on the show. Jim is a professional Spartan Racer, former pro off-road racer, businessman and motivational speaker who also has a podcast called "The Answer is Yes." Be sure and follow @JimBeaver15 on social media and subscribe to Project Action and the Down & Dirty Radio Show on iTunes. Jim Beaver has director/writer/producer of the Woodsrider Film, Cambria Matlow on the show today to talk about Sadie Ford's snowboarding journey. Be sure and follow @JimBeaver15 on social media and subscribe to Project Action and the Down & Dirty Radio Show on iTunes. Jim Beaver has professional off-road racer, motivational speaker, author, and entrepreneur Justin Peck on the show today talking about life, his career, and the balancing act. Jim also catches up with Dave Mason of Betonline.AG for some MMA news. Be sure and follow @JimBeaver15 on social media and subscribe to Project Action and the Down & Dirty Radio Show on iTunes. Jim Beaver has 3 time King of the Hammers champion Jason Scherer on the show this week talking about his 2019 victory and what it takes to be the king of the toughest off-road race on the planet. Be sure and subscribe to Project Action and the Down & Dirty Radio Show on iTunes and follow @JimBeaver15 on social media. On this week's episode Jim Beaver, along with Tiffany Stone, catch up with Hubert Rowland of Nitro Circus out at the 2019 King of the Hammer's event. They talk some of the craziest stories of his adventures with Travis Pastrana, his love of Polaris RZR's, and what's to come in 2019. 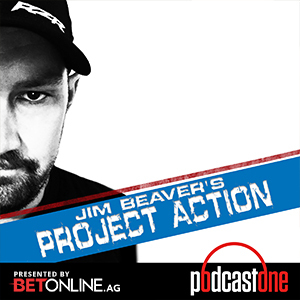 Be sure and subscribe to Project Action as well as the Down & Dirty Radio Show on iTunes and follow @JimBeaver15 on social media.